For most people, the word “spitter” evokes the thought of something unpleasant—angry llamas, perhaps, or individuals who require a little extra talking space if you want to stay dry. Not Rob Fisk. For him, the word means something beautiful, something high quality, something on which he’s built his life. We’re sitting in the hot June sun on the patio outside the Apple Lodge at Sponsel’s Minnesota Harvest Orchard, in Jordan, Minnesota. 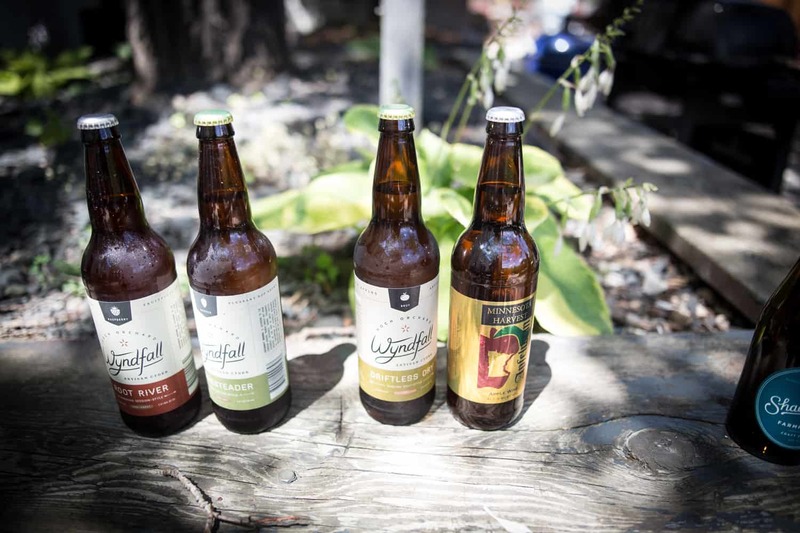 Minnesota Harvest is the new home of Wyndfall Cyder as of late this spring, and Rob has just finished installing his equipment in a large room behind the lodge’s industrial-sized kitchen. He had been operating in conjunction with an orchard in La Crescent, Minnesota, prior to the move, but saw an opportunity for more growth in Jordan. 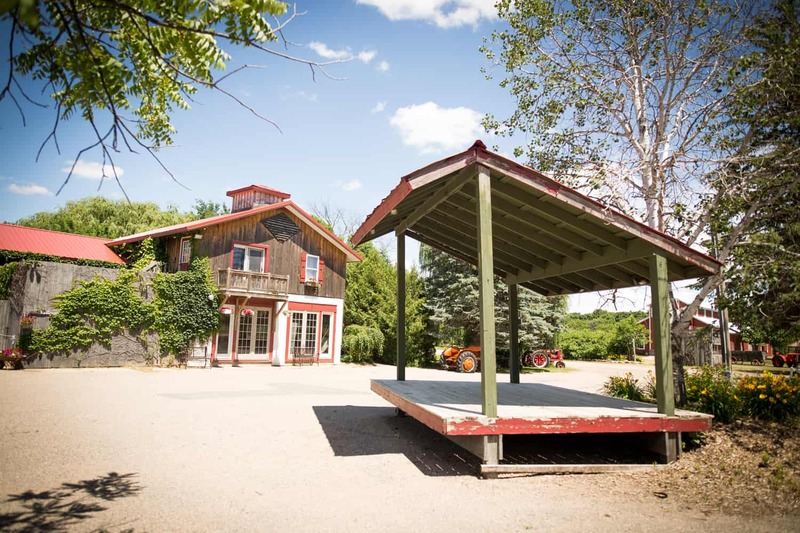 Minnesota Harvest has been in operation since 1971 and is a popular events venue and pick-your-own orchard. 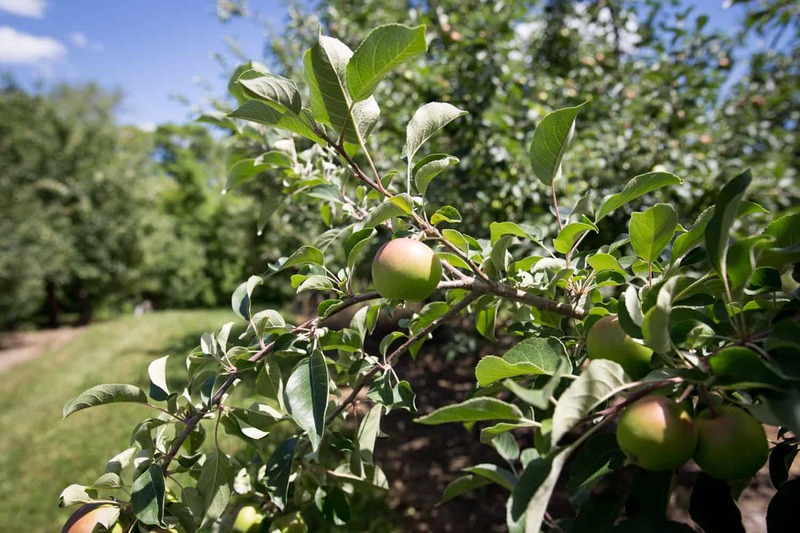 The 300-plus acre orchard boasts some 35,000–40,000 apple trees, and the owners “buy as many [new trees] as they can afford” every year. It’s a sprawling, pastoral setting just 45 minutes from the Twin Cities, and so far is proving to be an ideal location for Wyndfall to put down roots. The tannins that make these apples inedible are also the key to making the drier, English-style ciders (or “cyders,” as it’s spelled in the U.K., hence Wyndfall Cyder’s spelling) Rob seeks to produce. Table apples are bred for a balance of tart, sweet, and texture, not tannin. Once you ferment out all the sugar, you’re left with a tartness that’s “off the charts,” Rob explains. Rob first got into the fermentation game with beer, homebrewing with friends in college. 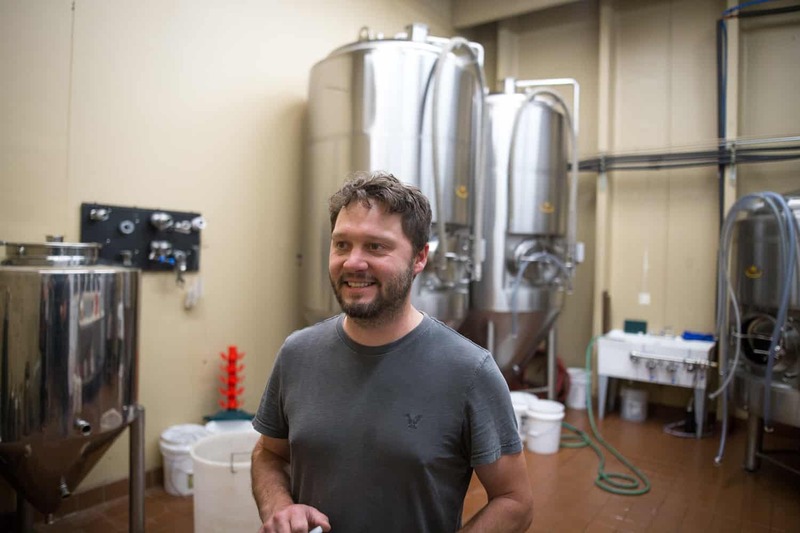 He was studying environmental policy and forestry at the University of Minnesota at the time, and the more he learned about homebrewing, the more he started thinking about switching from beer to cider. “I was loving brewing, but then I started getting into the sustainability aspect of everything, and it was like a light bulb went off,” he says. He returned to the University of Minnesota to get his master’s in horticulture, taking such classes as organic fruit production from professors like Jim Luby, the breeder of the Honeycrisp apple. 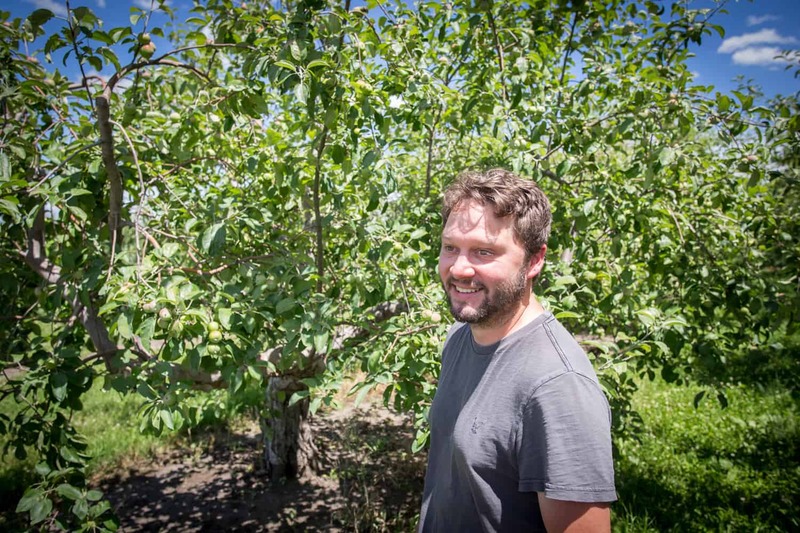 While he learned a lot, his focus remained on cider apples and someday opening his own cidery. Rob’s path to that goal wasn’t a straight one, though. Before starting Wyndfall in late 2014, Rob worked for the National Parks Service and United States Department of Agriculture. He traveled all over the U.S., tasked with jobs like getting dropped from helicopters onto mountains in Alaska to collect soil samples (with a shotgun, in case of bears). After a few years, he returned to Minnesota and took a job at the Natural Resources Conservation Service office in Jordan. 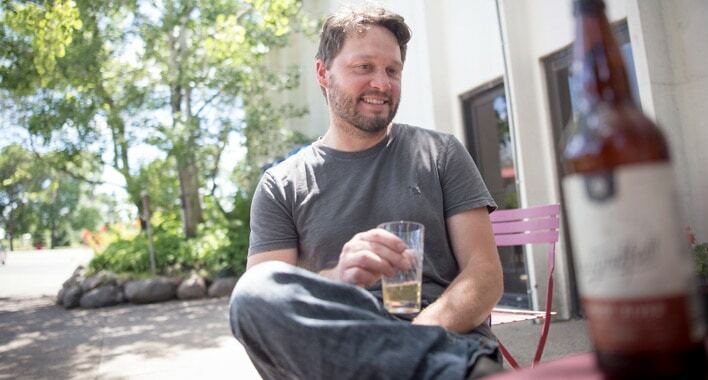 But being at a desk all day didn’t sit well with Rob, so when, in 2014, he got an offer to launch a cidery in La Crescent, he quit his job, sold his house, and put everything he had into Wyndfall Cyder. He released his first cider in spring 2015. This year’s crop at Minnesota Harvest looks good so far, and Rob is feeling confident about his production scale. In addition to his ciders—Root River, a semi-sweet raspberry cider; Homesteader, a semi-dry hopped cider; and Driftless Dry, an English brut-style cider—Rob will also be making a private-label cider for Minnesota Harvest. They just purchased a bottler, and hope to buy more equipment soon.